This is a follow-up to my Super Arachnix Drone, now with an even larger design. Bigger body, bigger legs, more armor, more armament! Should I go bigger still? 57 comments - Post a response! ...stop. Seriously. Stop. LEGO building is a small hobby on the side. I go 2 or 3 days without posting a new LEGO MOC and I start to get desperate comments & YouTube messages demanding that I do more immediately. This is completely unreasonable and completely unfair to me. Stop. This is a really weird one. I didn't take the time to give it any Hero Factory backstory. I didn't really even create it with any specific purpose other than to just put a bunch of semi-transparent parts on a hero-style skeleton! Ketta is just another really simple, really basic, really quick LEGO Hero Factory MOC made to go with the Breakout theme. 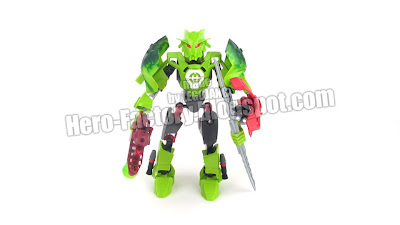 The idea here was just to use some Ultrabuild green parts and see how they'd look on a character that could conceivably look like an actual LEGO set, without a highly custom weapon or scratch-built body or what not. 32 comments - Post a response! 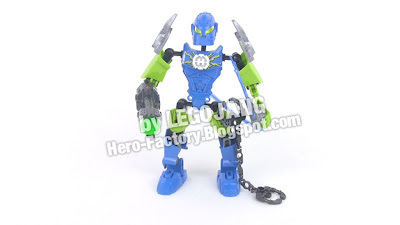 Here's another LEGO Hero Factory series 4 (Breakout) release, Furno. The original super-rookie! He may no longer be the front-running underdog in the series, but he's still liked by many, and thankfully they made him one of the larger heroes of the line. Tonight the original, Bionicle universe form of Lorne, my self-MOC, was finally disassembled to harvest its many "special" pieces and to make room for more Hero Factory creations. Lorne 2.0 lives on in its stead. 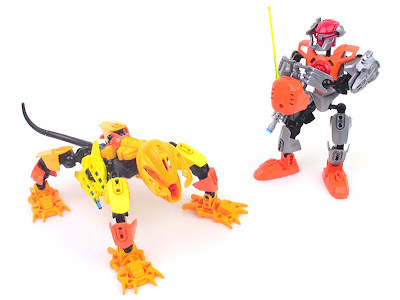 Behind the scenes, I've recently quietly disassembled an entire shelf worth of my favorite Bionicle characters, and over the past few weeks I've built 15 more new Hero Factory MOCs for which I'll start slowly releasing videos this week. Exciting times on the LEGO front! In somewhat related news, I've begun to realize that the overwhelming majority of my neatly-sorted Bionicle parts have not been touched all year, even when I've had intense MOC-making sprees. I'm a collector at heart and really, really like having "one of everything" at my fingertips, but what's the point if most of it sees no use? It's beginning to feel like there's another epic parts sell-off coming in the first half of 2012. 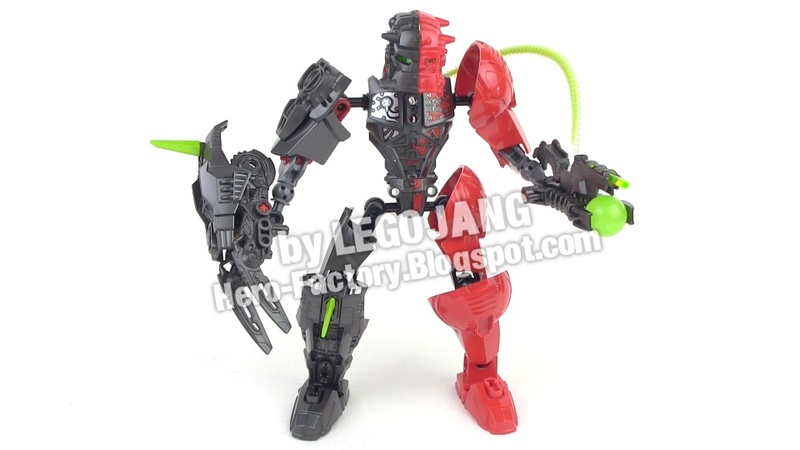 By popular request, here's a look at Splitface's head in solid red, and solid gunmetal gray by combining two into one. Also a comparison to Thunder from the very first villain series. PS: I will not link to them. I will not allow links to them. They are illegal pictures, stolen from LEGO & leaked by some unscrupulous individual(s) who have no regard for intellectual property. Redistributing these images or links to them is illegal. LEGO regularly sends out legal reps to do rounds around the 'Net to try to track these down and get them deleted, as they should. PPS: I will not refer to them as "5.0." First, they're just the second wave of series 4, not a whole new series. Second, the "x.0" naming convention was already dropped. Incidentally, this is also my first published video featuring my brand new camera! Out with the old, in with the new! Be sure to subscribe to LEGOJANG on YouTube! 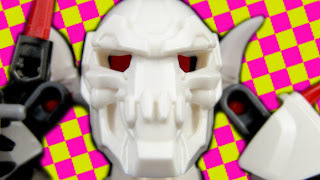 Next up in my LEGO Hero Factory series 4 (Breakout) set reviews is Black Phantom, the #1 evil overlord the heroes need to contend with this season! There's been a nasty rumor going around that the new Hero Factory game to go with the Breakout series would cost money. I don't know why so many folks got sucked into this black hole, but it's completely untrue. The new Breakout video at the official HeroFactory.Lego.com site says clearly & plainly that the new game will be free to play, just like all other official online Hero Factory content in the past. Please spread the word and end the misinformation. 37 comments - Post a response! Zeyek's latest revelation was that The Remainder had been awakened on the planet Quatros. What exactly is The Remainder? Is it a villain? 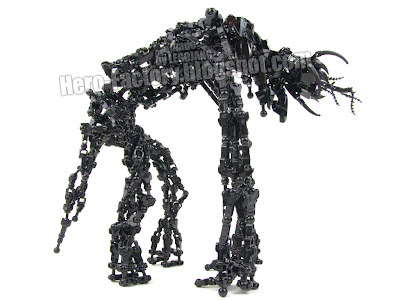 Will the LEGO Hero Factory need to fight it? I have answers! The Hero Factory's sudden return of most of the stolen Quaza crystals directly to the core of Quatros released a jolt of life-giving energy that enveloped the planet. It was such a strong wave that full vitality was restored to not only things that had been dying, but even some that had been fully dead. 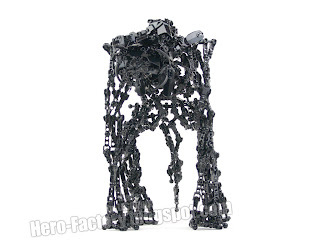 The Remainder is a sentient, yet zombie-like creature formed from the corroded, decayed components of all previous bio-robotic life forms on the planet. Its form and behavior are influenced by all of the creatures that contributed to its physical mass. 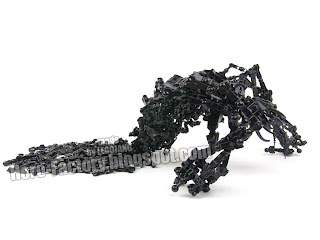 Partially restored consciences cluster together and mingle, and where the cluster is most dense, the enormous creature takes shape, emerging from the ground in a sequence that most closely resembles melting, but in reverse. The Remainder has shown no aggressive tendencies. In fact, because it has no single "brain," but instead what might be called partial "spirits" of tens of thousands of creatures, it appears to have no discernable motivation of any kind. It isn't good or bad, it just is. It walks, it roams, it dissolves, it reintegrates. I hope I'm not reading too much into Zeyek's own words, but it sounds as if The Remainder is now a permanent part of the Quatros landscape. For as long as the planet exists, so shall the Remainder. 71 comments - Post a response! LEGO Hero Factory & Bionicle prices at TRU raised? I visited Toys R Us today to pick up a couple small sets for some spares, and also some new toy-grade RCs to review. I didn't realize they were having a BOGO 50% off sale, but I did realize that prices on canister sets were up. 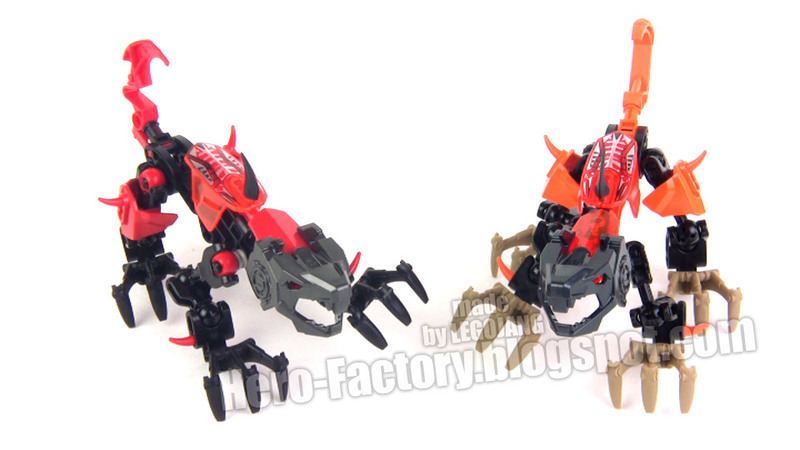 Hero Factory Heroes (2.0 & 3.0 alike) and Bionicle Stars sets (still lingering, nobody wants 'em) were at $9.99 US instead of the previous $7.99. Thank goodness for the sale, but wow, I never expected prices to go up on old stock. Has anyone else seen this locally? 94 comments - Post a response! A look at the villains seen in Part 1 of the Sho'i mission chronicle narrated by Zeyek. 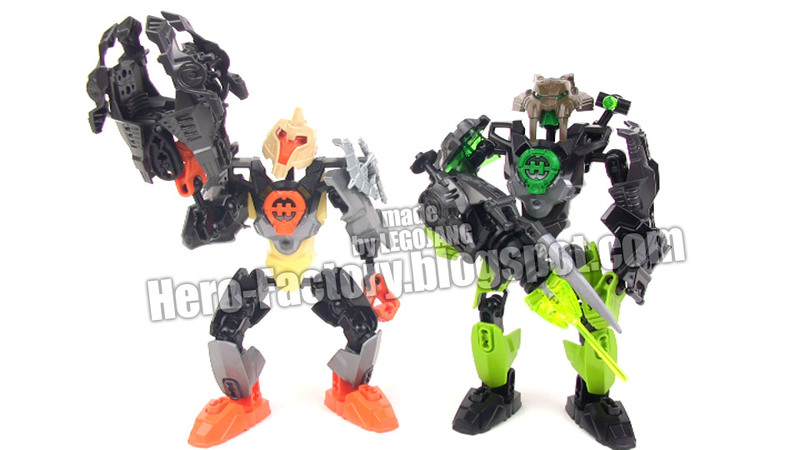 We now have confirmation that some ball & socket "bone" pieces will be available in neon green, white, and the so-called "dark azure." Be sure to post up your thoughts in the comments! Edit: Updated link with a better version of the video. 78 comments - Post a response! The conclusion of the Sho'i account introduces a never-before-seen experimental type of Hero Factory hero to attempt to address the mounting Reeka problem. Zeyek's first published chronicle since making the move to the Hero Factory universe recalls a most curious mission regarding what we Earthly beings would most closely relate to robotic... cats. 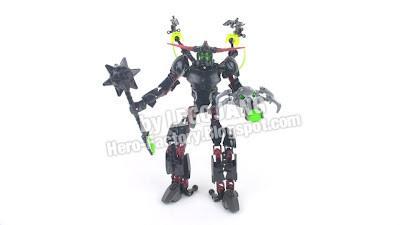 The evil Witch Doctor used Hero Factory technology to begin developing a secret drone army! The underground R&D and production facilities have been discovered, but the drones have escaped! He's not a teenager, and he's not a mutant, but do you know what? He sort of is a ninja-turtle! Ha! 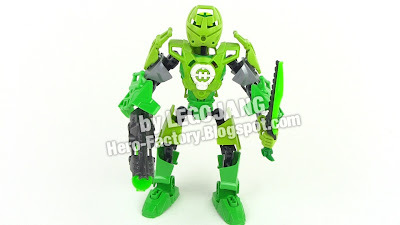 My very first LEGO Hero Factory hero mocs used Ben 10 parts as well. Most readers/viewers scoff at the very existance of Ben 10 parts on the face of the planet. 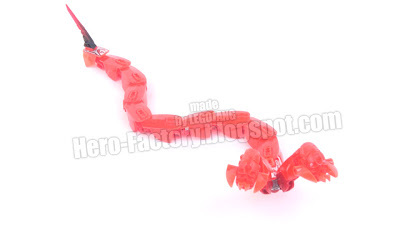 To me, they are pieces of plastic, like all other LEGO parts. 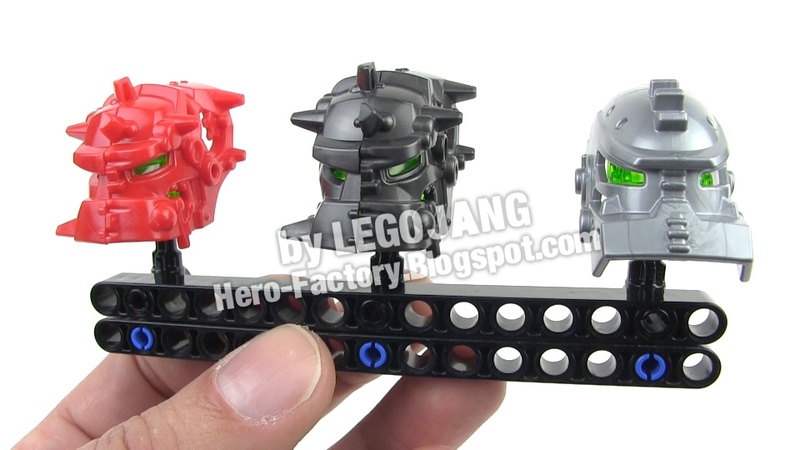 The helmet is a Bricklink purchase -- I never bought that actual set. 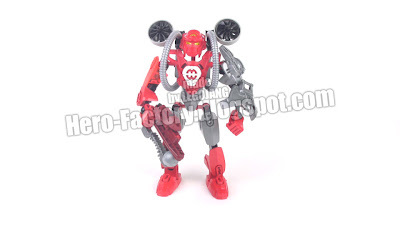 A MOC of Hero Factory's Rocka XL that's extra-small even compared to the normal version, he's Rocka XL XXS! This one uses a similar skeleton to my Epic Witch Doctor (XS) MOC, but the upper torso is quite different. 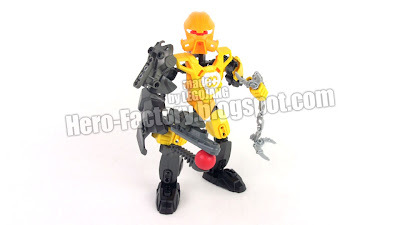 One of my main goals in doing both of these was to maximize the use of the so-called "Hero Factory parts," those ball-and-socket system pieces first released in the second season of Hero Factory for use in all LEGO large action figure series. I did many, many revisions before arriving at this form that I'm actually very happy with. There will be no further changes made and no "version 2." The LEGO Hero Factory has just lost one rookie, but gained a new fully-trained hero! Introducing Xephyr 3.0! Xephyr is the type of guy who always strives to be different, just for the heck of it. His fellow rookie classmates thought when he graduated to full hero status he might choose a shrimp for his 3.0 animal power, or maybe a quail, or sea snail. It had to be something bizarre, but nobody guessed he'd choose the iconic ancient scarab beetle! His special attack involves curling up into a ball and thrusting himself forward with an explosive rolling lunge that delivers a tremendous amount of kinetic energy to his target. He loves disrupting a group of multiple small enemies, treating them like bowling pins. Strike! 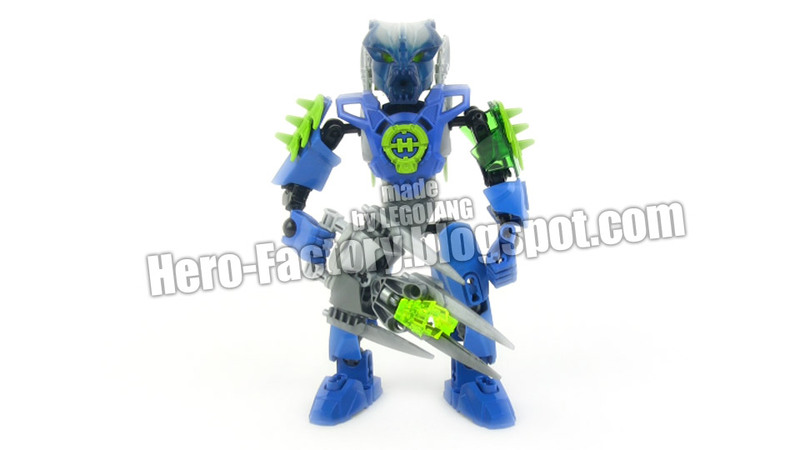 The colors of the translucent pieces on Xephyr's spectral blaster weren't chosen at random. I spent about 20 minutes trying different combinations and orders to come up with something that would look sufficiently random, yet somewhat balanced. Underneath the 10 or so layers of paint, Xephyr's helmet is actually a medium blue-gray. 44 comments - Post a response! 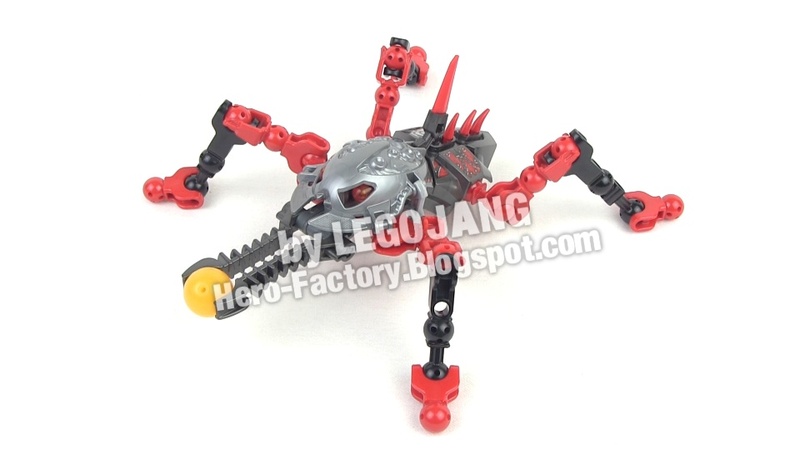 Here's a quick little LEGO Hero Factory creation, the Brown Recluse spider encountered on the planet Quatros. He's inspired by the Earthly Brown Recluse in looks & personality, but on Quatros they're not considered to be a real problem pest as they're about 2 meters long and thus practically impossible to miss and startle. A few more details in the video. All five LEGO Hero Factory "4.0" hero MOC videos! Folks who have followed along with the past day's blog posts can ignore this one, but if you're finding this through a web search, hello and welcome! 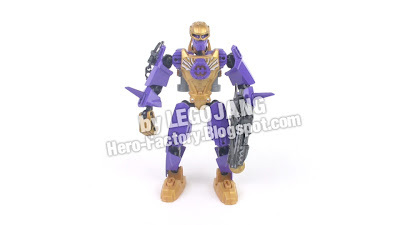 What I've done is put together custom creations based on what I saw in the first leaked preliminary Hero Factory series 4 pictures. As the new sets will use brand new parts that aren't available, these MOCs are not perfect replicas. They're just the best I could do, with the parts I have, to give you all a general idea of what these figures could look like based on the prototypes. Each post has a YouTube video linked to it, and yes, there are only five heroes this time! This is where things start to get testy with these series 4 LEGO Hero Factory MOCs, because Rocka is one of the heroes who's getting a brand new head mold, and I know a lot of readers get completely blinded as soon as they see the "wrong" head/mask/helmet on a MOC and can't get unstuck from thinking about the original official set that part comes from. Oh well, I say. Too bad. This is my best effort using existing pieces to duplicate the overall look of the upcoming version of Rocka based on the leaked preliminary Hero Factory series 4 pictures. To get a perfect version, we'll have to wait for the real thing to get released in stores, however many months away that will be! This LEGO Hero Factory MOC is of what we thought would be called Furno 4.0 (they dropped the number system though) based on the first leaked preliminary Hero Factory series 4 pictures. Just a quick little experimentation to see "what if." 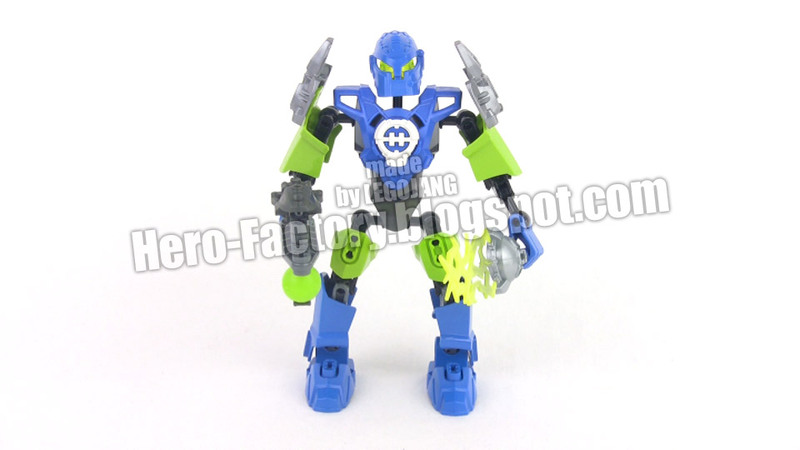 Here's a quick MOC of what we formerly called Surge 4.0 based on the first leaked preliminary Hero Factory series 4 pictures. Don't skip over the disclaimer :) This is just a quick representative build using existing parts I had on hand. 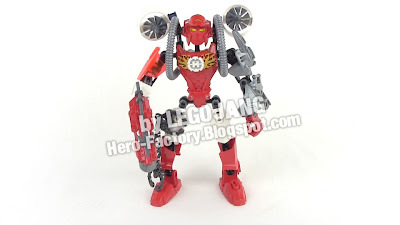 The preliminary photos of the upcoming 4th series of Hero Factory heroes (they're not called 4.0!) and villains have been illegally leaked and are spreading around the blogosphere and YouTube like wildfire, with copyright & intellectual property enforcement staff at TLG rightfully following closely and taking down the stolen content wherever they can. 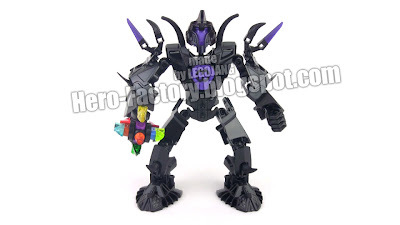 I use strong words like "illegally" and "stolen" to underscore the fact that whoever is leaking these photos is committing a crime and also doing LEGO itself a great disservice by giving competitors previews of products that won't be released for months. This is bad, very bad, and that's why you won't see me posting the pics nor linking to them. The theme is a jailbreak. Instead of going out & catching criminals & villains this time, our LEGO Hero Factory heroes will be re-capturing at least one main dude and his henchmen. 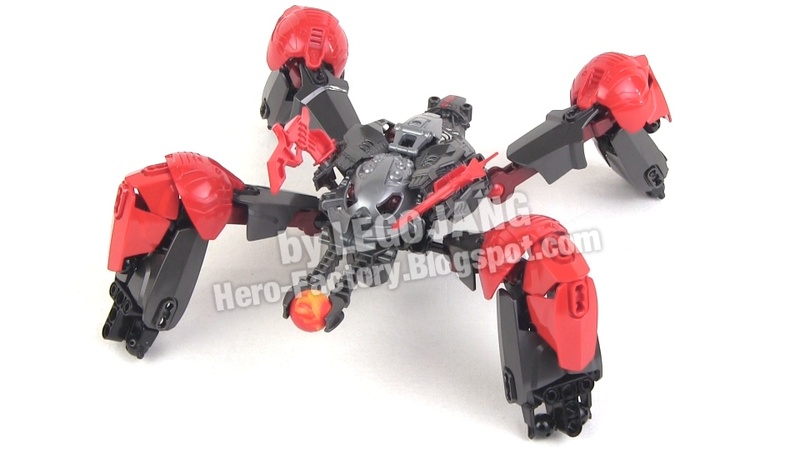 There was clearly a mandate & memo at TLG to reduce complexity of the Hero Factory series this time around and reuse more molds. One especially notable exception is a new armor piece that is very round and uses the two-peg attachment system to add on to other armor, creating large knee or shoulder guards. 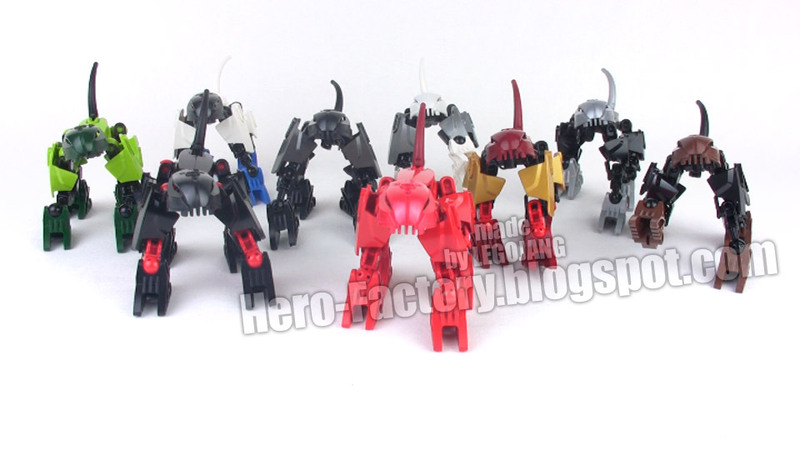 There are only five heroes in this series, Breez, Furno, Rocka, Surge, and Evo, the latter two having fewer parts and coming in a smaller canister. All heroes now use white hero cores, with yet another new mold (and possible 2-peg attachment?). Body armor has been reduced to one single piece with abdominal muscle detail and a rounded upper section with a unique print for each hero. The mold is the same one being used for the Super Heroes line. All heroes now finally have handcuffs (I've been waiting for these!). 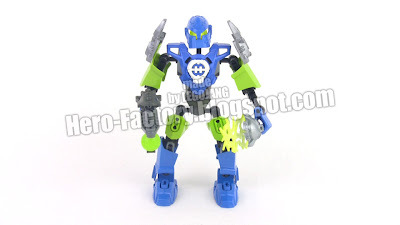 Each hero has a sphere launcher consisting of one half of an old thornax launcher plus one new piece that looks somewhat like a thinned down version of the large top plate from Mistika Toa Onua's weapon. Return of Agori/Glatorian heads! At last, the circle is complete. 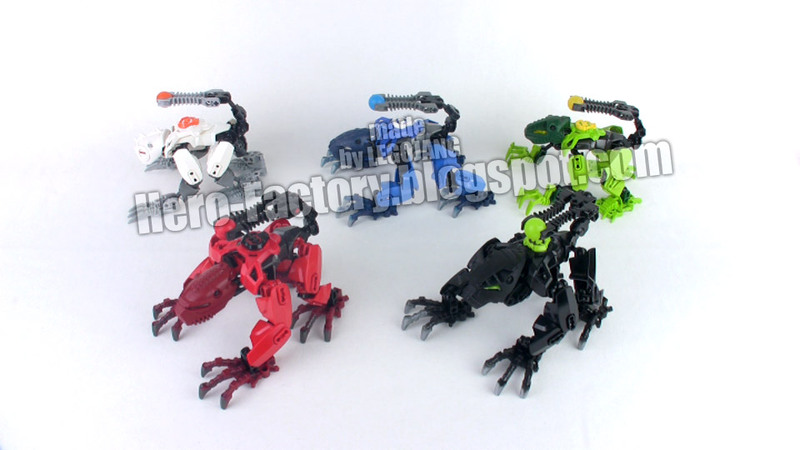 Rocka remains the front-runner of the series. His helmet looked like a Star Wars Imperial Darktrooper (SW Galaxy edition) but with an eyepiece. He bites off Furno 3.0's style with a bow weapon. He has extra arrows on an ammo belt sort of thing -- same piece that's hooked up to Super Heroes Iron Man's gun. Evo's helmet integrates his 2.0 visor side pieces into a single mold that made him look like a high-ranking samurai commander. He looked to be the least intricate of the two smaller characters. 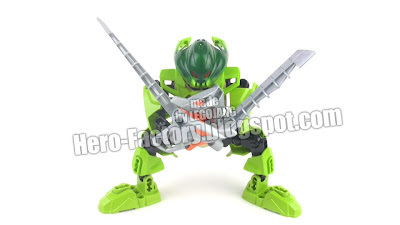 Surge looked like he gets his 1.0 weapon back and some Breez Green versions of his 2.0 forearms. Furno had all sorts of stuff going on. 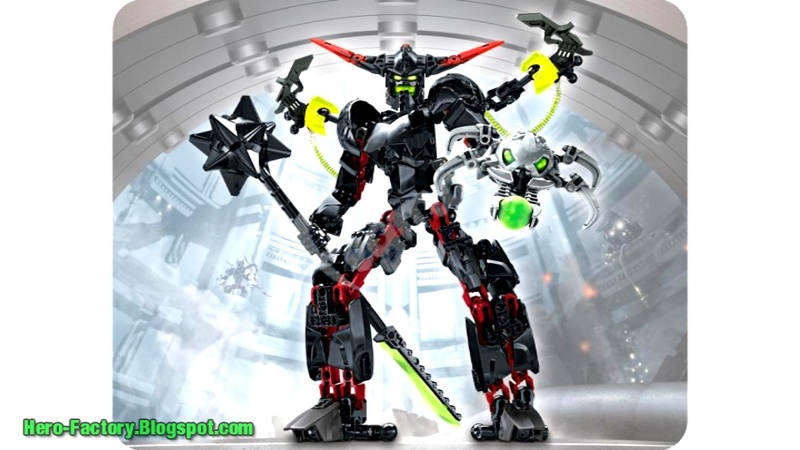 Big turbines coming off his shoulders, two large hoses wrapping vertically around him from mid-torso up to the level of his head, spike weapon on his launcher. 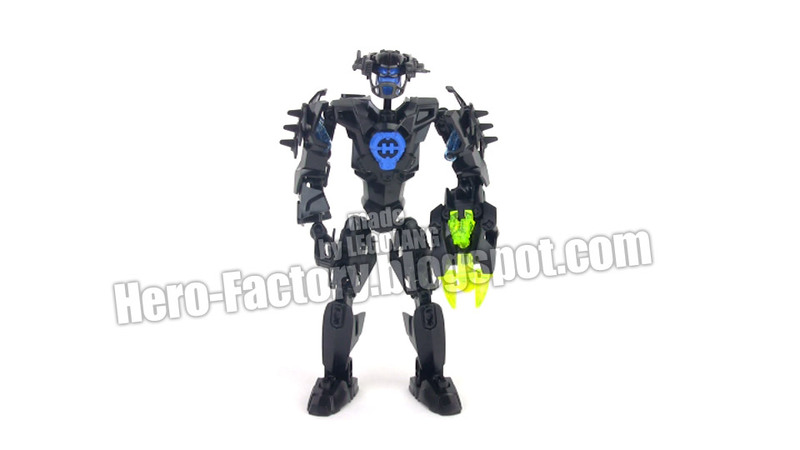 Kinda looked like he had some combiner style going on. Breez is back, with 1.0 feet! I think she actually had three of 'em -- one used on her back, I just saw a hint. She had ironically bulky shoulders, a nice tall double-bladed weapon and a small flat shield made of random hex shapes. Oh, and rockets. On her lower legs. Tiny ones. Five Hero Factory heroes now match up against five villains. Lego has evened the odds, sort of? Kind of? Heheh. Black Phantom is the new leader. He is essentially Fire Lord (twin horns & all, though corrupted Quaza spikes this time) with even less armor. Yes, less, or so it appeared to my eyes. Chew on that, with molar grinds of anger and disappointment. Thornraxx didn't look like a Thornax at all. Heh. His face looked like Stringer 1.0's helmet merged with a Toa Inika foot. With a sphere launcher sticking out. He has a pair of Gorast wings. Coolest thing about this guy? He had some turquoise ball & socket pieces! Also, like Waspix, there are lots of Thornraxxes. Thornraxxi? Splitface is the new Thunder. 'Nuff said, I think. He's just gunmetal on one side, red on the other. 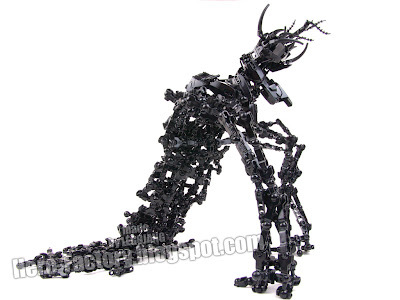 Could be inspired by an old Nigerian folk tale about a Loki-like "trickster" deity. Jawblade is JawS inspired, name-wise at least. He's a shark, with a tail, and a Skirmix-style lower jaw, and a frickin' laser beam on his... back. Well maybe it's not a laser, but some sort of red (spike) shooter thingy. 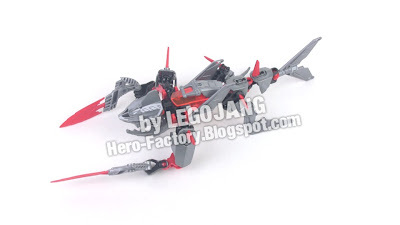 Oh, and though he's a shark, he has human-style arms & hands, and uses Furno 1.0 weapons. So weird. 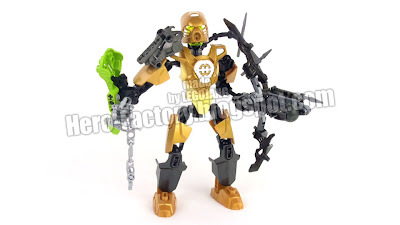 Toxic Reapa looked like a neon green & black merger between Toa Mata Kopaka and Corroder. I think that pretty much covers it. He got I think four 3L translucent neon green armor pieces and a pair of green & yellow flame accessories that attach with the 2-peg system. That's it for the series 4 LEGO Hero Factory dudes. PS: Furno (jet turbines work underwater?) vs. Jawblade, Breez vs. Thornraxx, Evo vs. Splitface, Surge vs. Toxic Reapa, Rocka vs. Black Phantom? Did I get that right? PPS: And I cannot and will not publish any links to any copies of the illegal, stolen photos as they are illegal and stolen and LEGO will rightfully take legal action. 47 comments - Post a response! 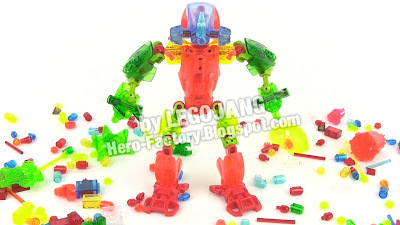 If I use more than one or two specific colors, even complementary colors or ones that are very nearby in hue and completely compatible, it's "too many colors"
If I use just one or two colors, "meh, too plain"
Bionicle parts make them "not Hero Factory"
Hero Factory only parts make them "meh, too plain"
MOCs made to look like they fit the theme when placed next to official sets are "meh, too plain"
Ones made with something a little different from the norm are "wrong" or "don't fit the theme"
MOCs that aren't 100% symmetrical left to right are "wrong"
NAH! I don't think so! I think the idea that everything needs to have just one consistent color, or one color plus black, silver, or white, or one main color and a teeny, tiny bit of another color is insanely limiting. Just because the official LEGO sets have one main color each, doesn't mean everything in the entire universe needs to have just one color (or one main color and a teeny, tiny bit of another). Red, orange, and yellow can work together. Blue, purple, and black go together quite nicely. White, tan, brown, and black can form a theme. You don't even need to look around at the entire world as a whole to see this. Just look at other LEGO releases, things outside the limited Hero Factory & Bionicle arenas. Look at City, Star Wars, or Technic sets. Tons of colors! Color is not a bad thing. LEGO parts are nothing but shaped pieces of plastic. 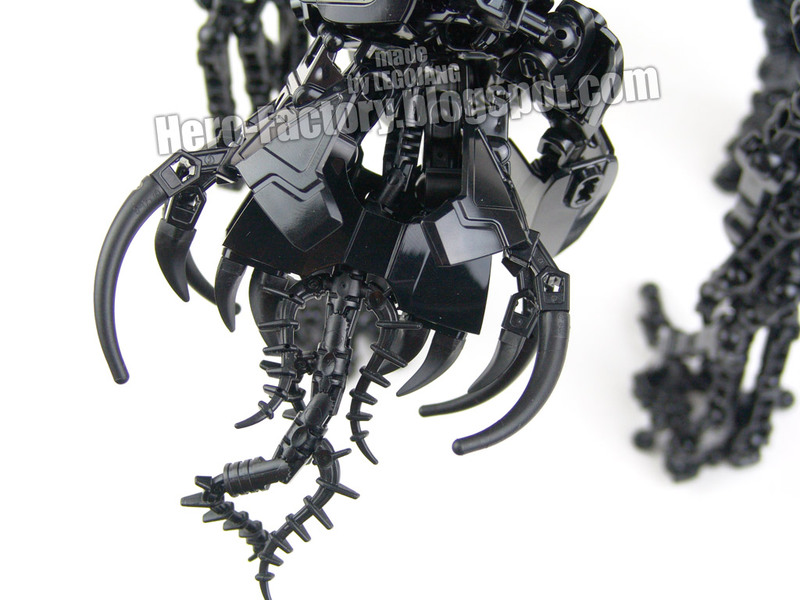 LEGO used lots of Technic pieces in Bionicle. 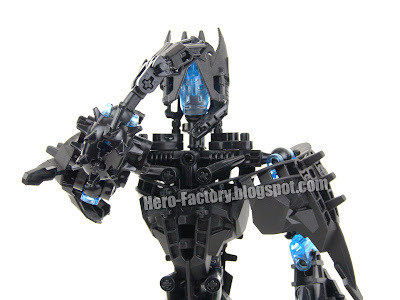 They've used Bionicle pieces in System and Hero Factory sets. Why can't I do the same? These parts aren't "supposed" to be anything. They're supposed to be used for whatever you want them to be. Most MOC makers recognize and embrace this philosophy. A foot can be used as a waist or a shoulder. A mask can be made into armor. A head can be a piece of a weapon. Open-mindedness makes life a lot more interesting and exciting. 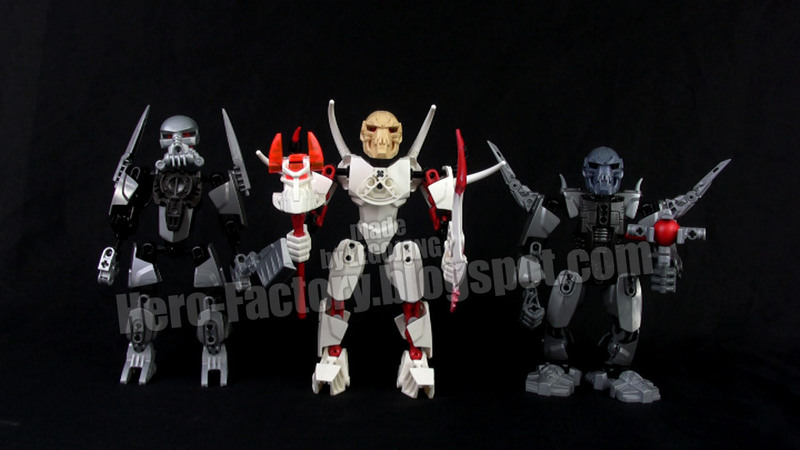 What's wrong with making MOCs that look like they fit in if you stand them next to the official sets? Conversely, what's wrong with trying something different? Just because we've only ever seen a handful of "official" Hero Factory characters and themes doesn't mean no others could possibly exist. One of the main points of everything LEGO does is to encourage imagination and creativity. 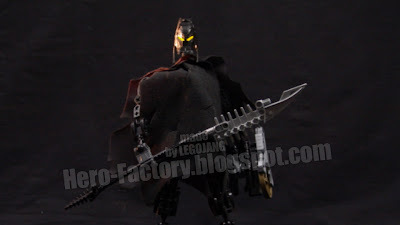 If Hero Factory was supposed to be an extremely rigid and tiny universe where new things were never created and only the "official" characters and stories were allowed to exist, they would have been made as traditional-style action figures that cannot be disassembled. In fact, LEGO wouldn't have made them at all. A lot of cool things in life are symmetrical. A lot are not. Symmetry means uniformity. Too much uniformity makes everything the same. What if everyone wore the same shoes or cut their hair the same way (parted down the middle, no less). If all things were required to be symmetrical, there would be no front passenger seat in cars, just a centered driver's seat (driver needs to be next to a door, so no, you couldn't have passenger seats on either side). 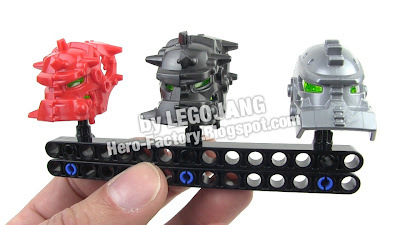 Bringing it back specifically to LEGO Hero Factory, the visors of Stormer 2.0 and Surge 2.0 would have been disallowed if everything needed to be symmetrical. Out of all of the heroes of all 3 series so far, only Breez 1.0 would have been truly acceptable as she's the only one who normally uses identical weapons and armor left to right -- in 2.0 form her armor was not symmetrical at all! 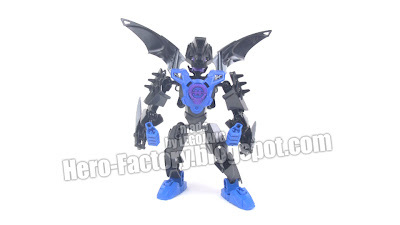 Oh no, assymetry in an official set! If somebody wants to make something symmetrical, let them. If they want to make something asymmetric, let them! So to anyone who wants to discourage me or anyone else from enjoying the full breadth of possibilities of LEGO MOC making, don't waste your breath! 51 comments - Post a response! Never fully understood from the start, Specter has fallen deeper beneath a shroud of mystery with the recent and very rare removal of his official role and mission status from the public record. It is not known what team he is associated with, nor what the chain of command above him looks like. We'll have to dig deeper for answers. Rumors continue to circulate of Specter, Onyx, and several other heroes meeting secretly. Whispers are of a "loss of order" within the Hero Factory. 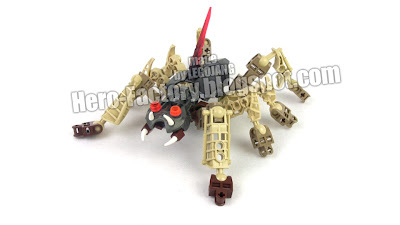 Specter 2.0 earned over 100,000 YouTube video views (and counting) and was the most frequently replicated 2.0 MOC in the official Hero Factory gallery. Specter 3.0 was built in July. I call this "version 1" of my LEGO Hero Factory Surge 3.0 MOC because I strongly suspect I'll do another version at some point in the future. The reason? I don't like this one. I wouldn't go so far as to say I hate it, but I definitely don't like it. It took longer to make than any of my previous hero MOCs due to many dozens of experiments with the head and weapon, and it still isn't right. However, folks have been so persistent in asking for one, I had to do something to stop the demands. The spikes on Surge 3.0's back are charge collectors central to his static blast system. The static blast emits in all directions like an expanding sphere and is effective between one and six meters from him. Yes, I did try a Gavla mask instead. While it's better-proportioned (the Vampruh one is obviously oversized), I couldn't get past the relatively blank expression. Did I mention I don't like this MOC? 28 comments - Post a response! I cleaned up some of my LEGO Hero Factory canisters & extra parts today and have a handful of spare canister top codes I figured I'd share with y'all from duplicate sets. I don't know if the codes are first-come first-serve, one-time-use-only, or if they're free-for-all, so maybe only one person will be able to use them, maybe multiple. What's certain is that what's here is here and that's all that is here and all that I have to post, so please don't try to demand more! Also, if you try one and it doesn't work, then it just doesn't work, and there's nothing I can do to change that.